The colors of shibusa are "muddy" colors. For example, in interior decorating and painting, gray is added to primary colors to create a silvery effect that ties the different colors together into a coordinated scheme. Depending upon how much gray is added, shibui colors range from pastels to dark. Occasionally, a patch of brighter color is added as a highlight. "Shibusa Modesty" iron glaze vase, Dorothy Bearnson, 1988. The seven elements of shibusa are simplicity, implicity, modesty, naturalness, everydayness, imperfection, and silence. They are adapted from the concepts authored by Dr. Soetsu Yanagi (1898–1961), aesthetician and museum curator, published in the Japanese magazine Kogei between 1930–1940. The aristocratic simplicity of shibusa is the refined expression of the essence of elements in an aesthetic experience producing quietude. Spare elegance is evident in darkling serenity with a hint of sparkle. Implicity allows depth of feeling to be visible through spare surface design thereby manifesting the invisible core that offers new meanings with each encounter. The person of shibui modesty exalts excellence via taking time to learn, watch, read, understand, develop, think, and merges into understatement and silence concerning oneself. Naturalness conveys spontaneity in unforced growth. Shibusa freedom is maintained in healthy roughness of texture and irregular asymmetrical form wherein the center lies beyond all particular things, in infinity. Everydayness raises ordinary things to a place of honor, void of all artificial and unnecessary properties, thus imparting spiritual joy—for today is more auspicious than tomorrow. Everydayness provides a framework, a tradition for an artist's oeuvre to be a unit not a process. 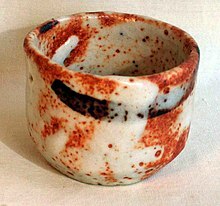 Hiroshi Mizuo argues that the best examples of shibusa are found in the crafts, ordinary objects made for everyday use. They tend to be more spontaneous and healthy than many of the fine arts. Imperfection is illustrated in Nathaniel Hawthorne’s gothic novel, The Marble Faun. The chapter "An Aesthetic Company" mentions some ragged and ill-conditioned antique drawings and their attributions and virtues. The aroma and fragrance of new thought were perceptible in these designs, after three centuries of wear and tear. The charm lay partly in their very imperfection; for this is suggestive and sets the imagination at work. Imperfection in shibusa Sōetsu Yanagi in The Unknown Craftsman refers to as "beauty with inner implications". Creation here means making a piece that will lead the viewer to draw beauty from it for oneself. Shibui beauty in Tea Ceremony is in the artistry of the viewer. Shibusa's sanctuary of silence is non-dualism—the resolution of opposites. Its foundation is intuition coupled with faith and beauty revealing phases of truth and the worship and reverence for life. In James A. Michener's book Iberia the adjective 'shibui' is referenced as follows: "The Japanese have a word which summarizes all the best in Japanese life, yet it has no explanation and cannot be translated. It is the word shibui, and the best approximation to its meaning is 'acerbic good taste.'" The author Trevanian (the nom de plume of Dr. Rodney William Whitaker) wrote in his 1979 best-selling novel Shibumi, "Shibumi has to do with great refinement underlying commonplace appearances." In the business fable The Shibumi Strategy, the author, Matthew E. May, wrote that shibumi "has come to denote those things that exhibit in paradox and all at once the very best of everything and nothing: Elegant simplicity. Effortless effectiveness. Understated excellence. Beautiful imperfection." Shibui, a registration or 'felt sense' of evolving perfection. What is being registered is the 'Life' behind the qualities of any experience. A 'felt sense' of qualities, such as, quiet beauty with intelligence, love, light, and joy. These qualities can be more easily registered when quietly viewing simple, natural everyday phenomenon or objects, such as a sunrise or a simple piece of pottery. Shibui can sometimes be more easily registered by two people in a meditative state (quiet in their emotions and their minds) while viewing the same phenomenon or object. For example, when viewing the same sunset or piece of art, subconsciously, both people register the qualities of the 'Life' or implicity underlying the experience or object; this registration of the underlying 'Life' precipitates into the conscious as registering something 'extraordinary' in the everyday 'ordinary'. If you both register, then looking into the other person's eyes, you understand that you both shared the same phenomenon, a 'knowing' of the underlying 'Life', or at least the qualities of that underlying 'Life'. The qualities registered can seem paradoxical. Complex experiences or objects seem simple; perfection is found in imperfection. All objects and experiences, both everyday and extraordinary, can have a beauty, a quiet purposeful intent, a cool 'matter of fact' underlying joy. Potters, musicians, painters, bonsai and other artists often work to bring in 'Shibui-like' qualities into their art. A few go behind these qualities to bring the underlying 'Life' into their art. Expert singers, actors, potters, and artists of all other sorts were often said to be shibui; their expertise caused them to do things beautifully without making them excessive or gaudy. Today, sometimes baseball players are even said to be shibui when they contribute to the overall success of the team without doing anything to make themselves stand out individually. The apparent effortlessness displayed by athletes such as tennis player Roger Federer and hockey great Wayne Gretzky are examples of shibumi in personal performance. Shibui, and its underlying 'Life', is found in all art and in everything around us—including ourselves. Taking the path to understand and experience Shibui, is a step towards understanding and consciously registering the 'Life' underlying all. 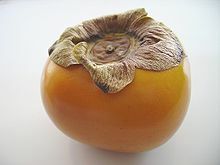 Originating in the Muromachi period (1336–1573) as shibushi, the term originally referred to a sour or astringent taste, such as that of an unripe persimmon. Shibui maintains that literal meaning still, and remains the antonym of amai (甘い), meaning 'sweet'. 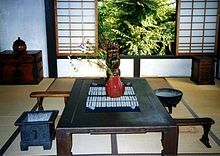 However, by the beginnings of the Edo period (1615–1868), the term had gradually begun to refer to a pleasing aesthetic. The people of Edo expressed their tastes in using this term to refer to anything from song to fashion to craftsmanship that was beautiful by being understated, or by being precisely what it was meant to be and not elaborated upon. Essentially, the aesthetic ideal of shibumi seeks out events, performances, people or objects that are beautiful in a direct and simple way, without being flashy. Soetsu Yanagi work as translated by Bernard Leach in The Unknown Craftsman discusses shibumi. The concept of shibusa was introduced to the West in August and September, 1960, in publications of the American magazine House Beautiful. ^ a b Dr. Mazhar Hussain; Robert Wilkinson (2006). The Pursuit of Comparative Aesthetics: An Interface Between East and West. Ashgate Publishing, Ltd. pp. 227–8. ISBN 978-0-7546-5345-5. ^ a b De Garis (5 September 2013). We Japanese. Routledge. p. 15. ISBN 978-1-136-18367-6. ^ Sunamita Lim (2007). Japanese Style: Designing with Nature's Beauty. Gibbs Smith. p. 41. ISBN 978-1-4236-0092-3. ^ Takie Sugiyama Lebra (1976). Japanese Patterns of Behaviour. University of Hawaii Press. p. 20. ISBN 978-0-8248-0460-2. Tanizaki, Junichiro (1977)In Praise of Shadows, Sedgwick, ME. Leete's Island Books. ISBN 978-0-918172-02-0. Yanagi, Soetsu (1966) "Mystery of Beauty" lecture, The Archie Bray Foundation, Helena, Montana. Yanagi, Soetsu (1953) "The Way of Tea" lecture, Honolulu Academy of Arts, Honolulu, Hawaii. Young, David E. & Young, Michiko Kimura (2008), http://www.japaneseaesthetics.com.